Ferrari: Under the Skin brings together 14 rare and memorable Ferrari models, worth a total of £140 million. They also include the most technologically advanced Ferrari to date and the car that Stirling Moss drove when he won the 1960 Tourist Trophy. The show starts with an exact replica of the first Ferrari car ever made. Created in 1947, when the Italian economy was damaged from the second world war, the Ferrari 125 S marked an achievement in history. The rosso-corsa-red race car sported a 1.5-litre V12 engine producing around 118 horsepower, and could reach speeds of up to 130 miles per hour. 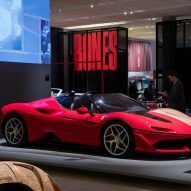 The exhibition ends 70 years later with the LaFerrari Aperta – Ferrari's latest model, and one of the most expensive cars ever made. Loaned to the Design Museum by British chef Gordon Ramsay, the supercar boasts a 6.3-litre V12 engine, but also incorporates a hybrid system with a battery pack and electric motor, which feeds the engine with extra power generated through braking. The car can reach speeds of up to 217 miles per hour. The other 12 cars are showcased across three galleries. 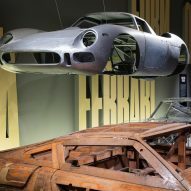 A sculpted clay model and wire-frame chassis model are among the exhibits in the first room, both used in design development. There is also a wooden model, which would once have been used as a mould for manufacturers to sculpt metal panels around. 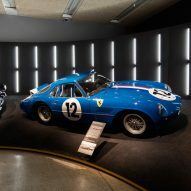 Cars showcased in the second room include the 275 GTB4, considered by many to be the brand's most beautiful car, and the F40, which was designed to commemorate Ferrari's 40th anniversary in 1987. Cars in the third room include the Formula One vehicle driven by Michael Schumacher as he won his third world championship in 2000, making him Ferrari's first champion in 21 years. 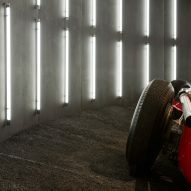 The signature red F1-2000 track car epitomises the competitive racing that Ferrari is known for. It is displayed alongside helmets, trophies and racing suits worn by Schumacher, as well as other winning drivers Alberto Ascari, Mike Hawthorn and Kimi Räikkönen. 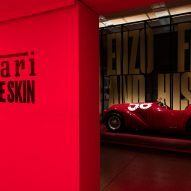 Ferrari: Under the Skin aims to provide a detailed look into all aspects of Ferrari's aesthetic, functional and engineering design, from Enzo Ferrari's initial concepts on paper to the final Ferrari production vehicles. 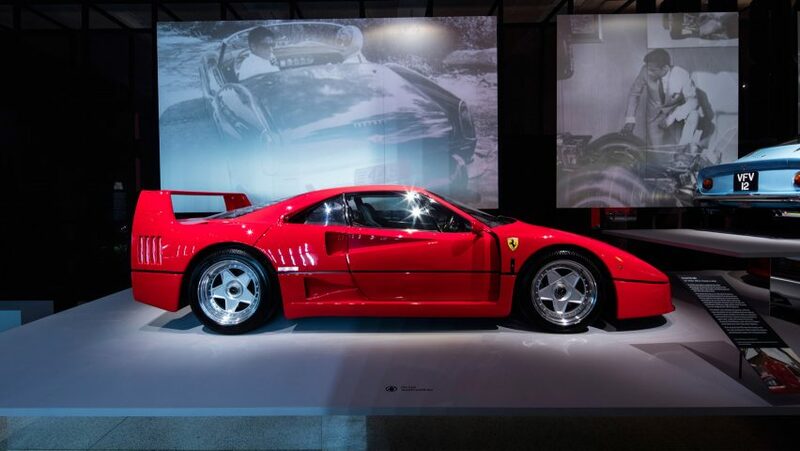 Coinciding with the brand's 70th anniversary, the show also features original sketches, early design models, and personal letters and memorabilia from Ferrari himself, most of which has never been seen outside of the company's museum in Maranello, Italy. "The depth of emotion goes far beyond the external beauty of their cars," said Design Museum founder Terence Conran. 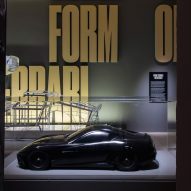 "What excites me so much about this exhibition is the rare opportunity to glimpse behind the scenes and experience the dynamic between engineering, manufacturing and design, which produces Ferrari's magic ingredient," he added. The show was curated by Andrew Nahum and Gemma Curtin. It is on show at the Design Museum's new home in Kensington, London, from 15 November 2017 until 15 April 2018. "Ferrari represents an ideal case study in design and development. 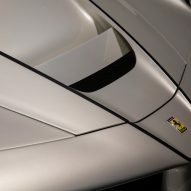 Ferrari uses the subtle and often unseen techniques of automobile design, but with the utmost care and precision," said Nahum. 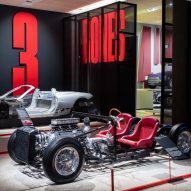 "The exhibition provides an insight into the history and practice of the whole private world of automotive design." The Design Museum is also currently exhibiting the Beazley Designs of the Year 2017 show, celebrating the world's best designs from the past year. Dezeen is media partner for Designs of the Year, which this year includes designs by Kanye West, IKEA, OMA and David Adjaye.